20 years ago, The Crow burst into movie theaters, and 20 years later, it continues to fascinate us. The question has always been whether it would have been as successful had star Brandon Lee not died towards the end of production, due to a faulty gun prop. Lee played Eric Draven, a dead rocker bent on revenge after his girlfriend was raped and murdered while he watched and then he too was killed in Detroit on Devil’s Night, October 30th. The critically acclaimed movie, based on the James O’Barr comic book of the same name, achieved cult status…and some terrible sequels. 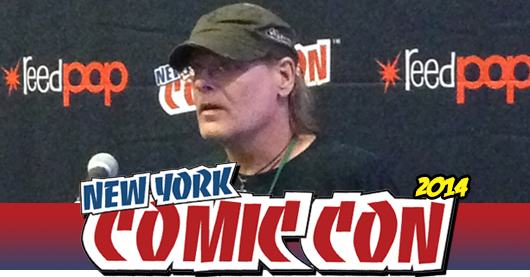 On Thursday night, O’Barr made his first appearance at New York Comic-Con at the panel “Twenty Years of “The Crow” with James O’Barr,” where he talks about the original film as well as the upcoming reboot. IDW Publishing has done a fine job since taking over the license for James O’Barr’s The Crow, with a bevy of new series based on the classic property. 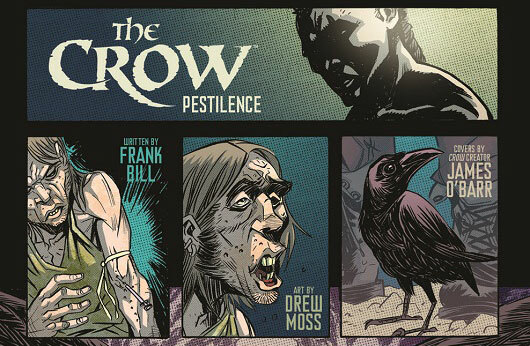 IDW has announced their next series for the goth spirit of vengeance with The Crow: Pestilence coming in 2014. The miniseries will be written by novelist Frank Bill (Donnybrook), and this will mark his first comic work. 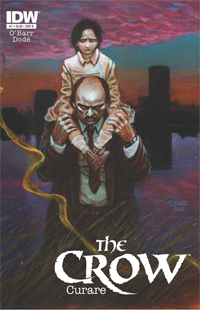 Art on the series will be provided by Drew Moss (The Colonized), with covers coming from The Crow creator O’Barr. Pestilence takes the Crow down to Juarez, Mexico for another round of revenge, and that’s about all we know so far. We can assume some tragic figure is going to die tragically and then come back to life and kill a bunch of people as is par for the course with The Crow. 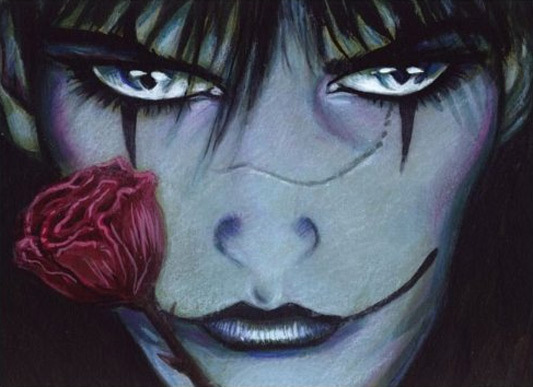 The folks over at Shock Till You Drop have debuted a Comic-Con exclusive teaser poster for Javier Gutierrez‘s reboot of Alex Proyas’ 1994 film The Crow. The poster features the art of James O’Barr, creator of 1989’s The Crow comic book. Check out the poster here below. As the poster declares, The Crow will begin shooting in 2014. During the convention, STYD had a chance to speak to Gutierrez, who is directing the reboot for Relativity, and O’Barr, who reportedly recently came onto the project as a creative consultant. O’Barr’s involvement is definitely a good sign, considering how long the project has been in development hell. (You can look back in our archives to see how many directors, writers, and studios its been through already, as well as lawsuits and possible lead actors). The Crow creator James O’Barr makes a much-celebrated return to his beloved character with his latest paranormal crime drama The Crow: Curare #1 from IDW Publishing. Thanks to the strength of the O’Barr’s writing and his tendency to NOT pull punches, dedicated fans of the The Crow tales will feel like they’ve been reunited with an old friend while readers new to the work will probably wonder if they’ve stumbled into a late-night cable series instead of a comic book. O’Barr continues to deliver a surreal mix of plausible real-life horrors with supernatural vigilante justice in this launch. Down-on-his-luck detective Joe Salk is haunted, both figuratively and literally, by a case involving the brutal murder of a young girl. He becomes so consumed with trying to find justice for a victim that reminds him of his own children that he eventually causes his marriage and family life to crumble. Every single one of us has felt the need for revenge at some time or another. What if that burning anger in your heart was enough to bring you back from the dead to exact your vengeance? Would you embrace it and the power that comes with it? The Crow: Skinning The Wolves is all about vengeance and justice, though it does lean a lot heavier towards vengeance more often in this story. Not that justice isn’t served. No, justice is served up steaming hot in the dead of winter, in a very sudden manner. But then, The Crow has always been about turning the tables on those that commit atrocities and embrace evil. Ever since I first read the original story of The Crow by James O’Barr, I have been fascinated by the concept of a supernatural being that exists to deliver justice and bring a sense of peace to those who were wronged in life. With a familiar in the guise of a crow, these restless spirits are housed once again in the bodies they once inhabited. The crow leads them to their prey and grants them their un-life until they have completed their tasks that will allow them to find peace. 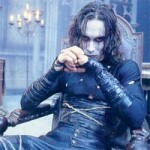 The long-in-development reboot of The Crow has gone through a vast number of attached talent in its pained journey just to get the end of pre-production, including stars Mark Walhberg and Bradley Cooper, screenwriter Nick Cave, and first assigned director Juan Carlos Fresnadillo (28 Weeks Later). The latest director on the project is F. Javier Gutierrez (Before the Fall) and most recently it looked like Tom Hiddleston of Thor and The Avengers was in talks to star in the title role, as was Alexander Skarsgard of True Blood fame. 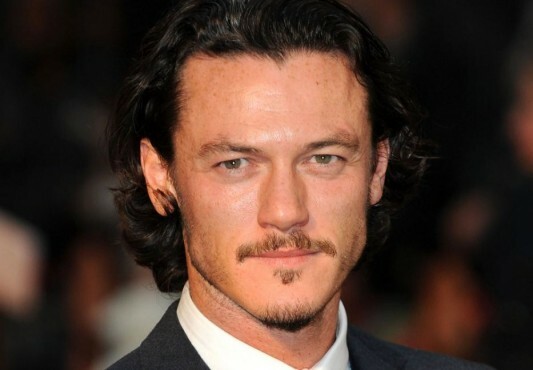 Well, the news of either Hiddleston or Skarsgard’s imminent casting seems to have been little more than wishful thinking on the part of many because it appears that the role has been filled by Welsh actor Luke Evans, soon to be seen in Fast & the Furious 6 and The Hobbit: The Desolation of Smaug. Evans, who recently also signed on to star in Universal Pictures’ summer 2014 release Dracula Year Zero, could previously be seen in the 2010 remake of Clash of the Titans as well as Ridley Scott’s Robin Hood and the 3D re-do of The Three Musketeers. Each and every week “Donner” Henchman21 AND “Blitzen” MK2Fac3 read a lot of comics. Seriously you guys, a lot of comics. Maybe too many comics. I mean, it is possible… theoretically. Naturally, they looks forward to some more than others. I mean, who doesn’t? So, let’s take a look into the depths of their pull lists, grab some comics, and they’ll let YOU know what the top books to look forward to are for the week of December 12, 2012. Single issues and trades, they’re all here. This Wednesday is a special day. I mean, 12/12/12 must have some kind of numerological significance or something. More than that, it’s a day for new comics, which is good news for everyone. So, here are a few books to check out this week. Remember, comics make a great gift during this joyous time of year, so pick up a few to hand out or just buy a bunch for yourself. This ain’t no naughty or nice list, it’s the GoD List! Get ready for the return of The Crow, the fan favorite series originally created by James O’Barr. Coming in 2012, IDW Publishing will publish several series set both in the universe of the original comics, as well as one based on the upcoming feature film. 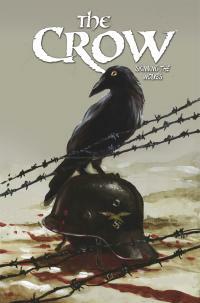 In addition to the new series, IDW will be offering collector’s editions of all the existing Crow comics. “I edited the last Crow series when I ran Todd McFarlane’s comics in the late ‘90’s, and we’re looking forward to bringing this classic character back to the medium in 2012 at IDW,” said Ted Adams, the company’s co-founder and chief executive officer, in a statement released by IDW last week. Ok, let’s get the relevant details out of the way immediately. They’re remaking The Crow and Stephen Norrington is being tapped to write and direct it. The classic James O’Barr comic was adapted to screen in the nineties by director Alexy Proyas and it starred the late Brandon Lee in his final role. Lee was killed during filming in an eerie on-set firearms accident that hearkens back to a scene from Game of Death which starred his father Bruce Lee, who died from injuries sustained during the filming of a movie as well (well, the details are hazy on how the cerebral edema came about, but it’s still eerie… deal). There were a few sequels: a part two which got a proper theatrical release but unfortunately went in the wrong direction. While the O’Barr comics had a palpable ethereal quality they were not overtly supernatural. The comic (and the original film) was a sanguine tale of revenge whose focus was on love and loss. But the sequel hijacked the most mediocre of other-worldly plot-elements from the first film and ran off a cliff with them creating their own absurd mythos. The subsequent direct-to-DVD jalopies are hardly worth a mention beyond that they exist and the latest one featured a barely recognizable Edward Furlong in the pole position.